With the holidays approaching, now is the perfect time to get your bar set up. 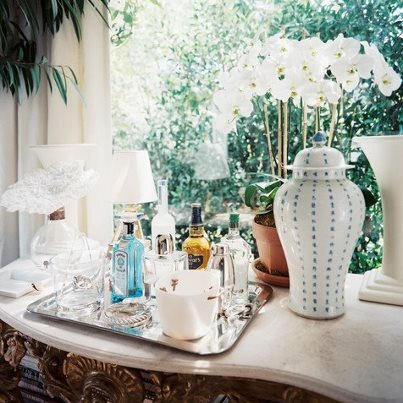 No need for a bar cart - a tray on a table, chest, or even a countertop will do just fine. Here a silver tray looks very dressy. Just be sure to treat it like a tablescape and not just functional, adding some pretty (Chinoiserie) touches as here with a ginger jar and orchid.